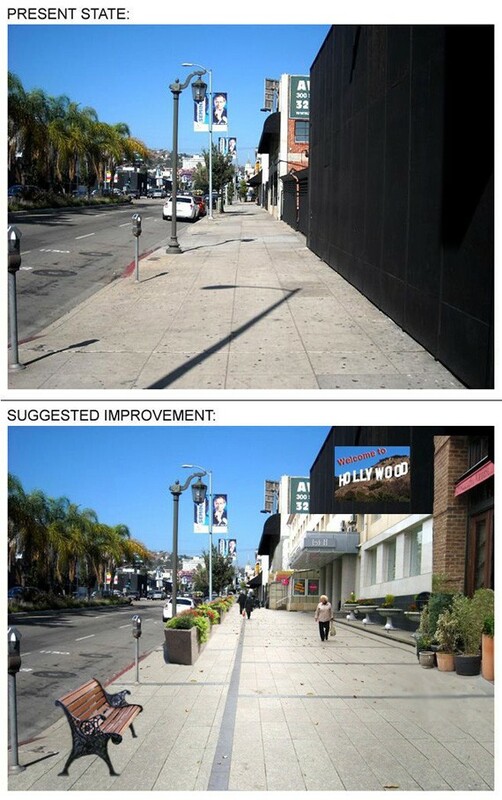 As part of a personal re-visioning process, Friedman looked at 15 sections of Hollywood area streets to see what LA. could look like. You can see all the images in a much larger size after the jump. …Unless you deviate a block or two. Once you accidentally leave the tourist area, real Los Angeles opens-up: utilitarian low-rise buildings & warehouses, auto body shops & pawn shops, tattoo and smoke stores, old box-type apartment structures, blighted development, and an endless parade of empty concrete sidewalks. In addition, there are countless numbers of creepy individuals and drug addicts, smoking pot as though it’s Amsterdam! “Why are there no public areas or plazas?” “What about parks?” “Where can I safely walk with my family?” “Who created those naked concrete sidewalks?” Those are some of the issues unsuspecting newcomers immediately face. Welcome to City of Angels! You’re now in a car-centric town where pedestrians are treated like second-class citizens, and where car dominates our life. Except for a handful of small pedestrian spots in parts of Hollywood, Downtown Los Angeles, Beverly Hills, the Santa Monica civic center, and artificial outdoor malls the Grove and Americana, the “Nobody Walks in L.A.” notion is still in place. Sidewalks exist in most areas, but their anti-pedestrian design – or rather, lack of any proper urban design – makes walking in L.A. extremely unappealing. In this case, we’re talking about middle of Hollywood! All of the surrounding streets – Sunset Blvd, La Brea Ave, Highland Avenue, Vine Street (south of Sunset) – offer nothing but primitive utilitarian automobile corridors. Lack of crosswalks and pedestrian-oriented intersections frustrates even further. Anyone who travels beyond Greater Los Angeles will notice how much more other cities offer: wider, decorative (not concrete) sidewalks, plenty of plantings and trees, large buffer zones, public areas and plazas. Embarrassingly, L.A. does not yet offer its visitors (let alone residents) normal conditions for a family outing, unless long driving and parking hassles are involved. After being stagnant for decades, Los Angeles is finally starting to improve. Buses and trains are returning. Density is slowly flourishing. Downtown L.A. is transitioning from a high-crime area to a safe family-friendly district. 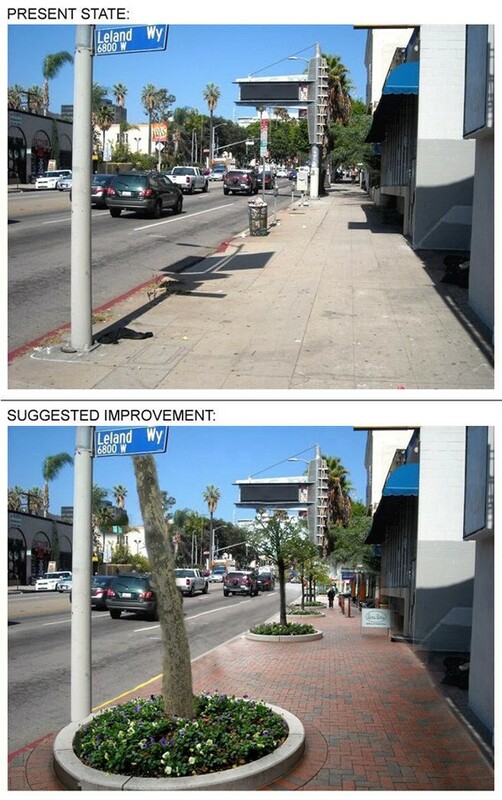 Various regions now offer improved pedestrian conditions, though as a whole L.A. lags behind other world-class cities. Sadly, our city municipalities still demonstrate their outdated car-only approach, refusing to properly invest in our sidewalks and landscaping. Private developers thus far are our only hope, as every new project improves a given area. But developers only improve individual spots, not the city overall. It’s time for City of L.A. to step-in, and to build the environment for people, not cars. It’s time to give our sidewalks the deserved width and aesthetics, implement decorative crosswalks, plant deciduous trees and creating buffer zones, build pedestrian plazas, and get rid of blight and concrete. 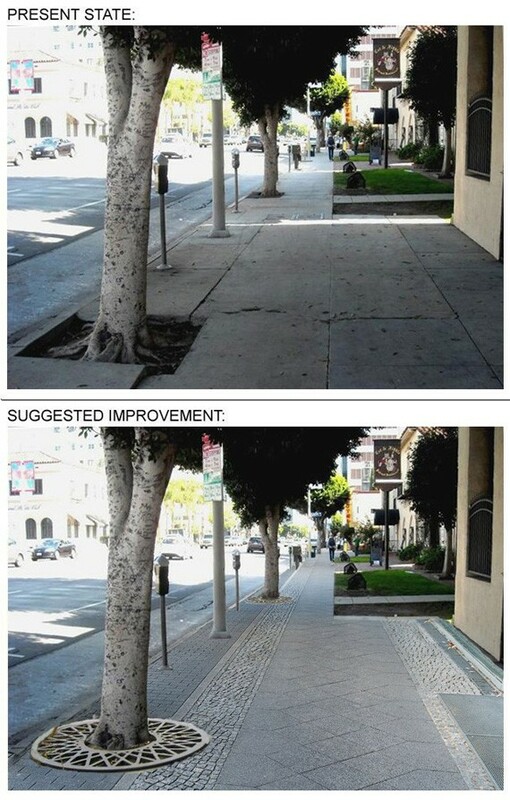 I’m an advocate for sustainable, family-friendly infrastructure, and decided to create renderings of improved sidewalks. Ironically, I did not have to go anywhere far to present compelling evidence: ugly sidewalks and lack of pedestrian environment is just outside the door, in Hollywood! While working on the project, I realized more and more just how awful our sidewalks are. As you will see on the photos labeled “PRESENT STATE”, Hollywood streets are a shame, compared to even our own Downtown. So, please see some examples of just a few popular spots that I photographed, and then created renderings – to demonstrate how much better things can look. PRESENT: Utilitarian concrete sidewalk, poor (if any) landscaping. Primitive crosswalk. IMPROVED: Decorative sidewalk with brick-block decorative pavement, enhanced landscaping. Distinctly marked crosswalk, also with decorative pavement. Note: many surrounding areas already have decorative marked crosswalks. PRESENT: Utilitarian concrete sidewalk, poor landscaping, ugly bench. Overall primitive setting. IMPROVED: Decorative sidewalk, enhanced landscaping (with planted flowers). Decorative streetlights. Area #3. Sunset Blvd (south side), east of Highland Ave. PRESENT: Naked concrete sidewalk, no landscaping or trees. Outright primitive setting. 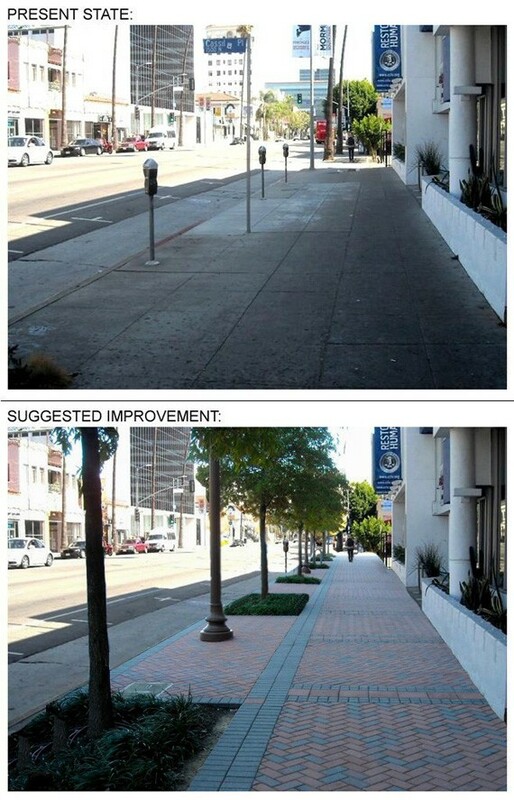 IMPROVED: Decorative sidewalk, plenty of trees. 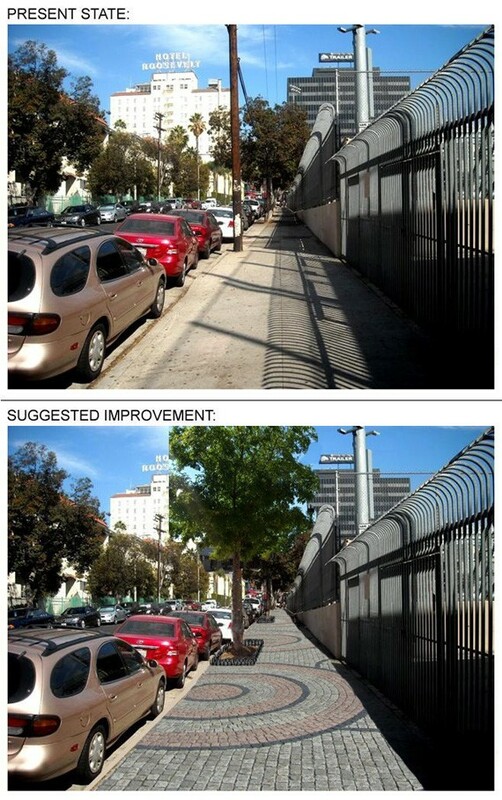 Dramatically improved streetscape. Safe pedestrian “buffer zone”. Area #4. Sunset Blvd (south side), west of Wilcox Ave. PRESENT: Primitive concrete sidewalk, full of cracks & breakage. Unmaintained trees’ base area. IMPROVED: Decorative sidewalk. Trees guarded with decorative protection (safer for pedestrians, better for trees). Area #5. Sunset Blvd (north side), east of Highland Ave. PRESENT: Primitive concrete sidewalk, barely any landscaping, no deciduous trees. IMPROVED: Decorative sidewalk, plenty of trees, decorative streetlights. Greatly improved walkability. Area #6. Sunset Blvd (north side), just east of Highland Ave. PRESENT: Primitive narrow concrete sidewalk. No landscaping, no deciduous trees. Old unmaintained lawn. IMPROVED: Decorative sidewalk. Deciduous trees, maintained lawn with fresh grass. Flower planters on sidewalk. Area #7. Orange Drive (west side), north of Sunset Blvd. PRESENT: A truly ugly spot! Old building with nondescript colors. Primitive concrete sidewalk/driveway, no landscaping or trees. Paradise for graffiti vandals and skateboarders. Note: Only a block away from the Hollywood Walk of Fame! IMPROVED: Repainted building garage. Added planters. Partially decorative sidewalk, decorative streetlight, deciduous tree. 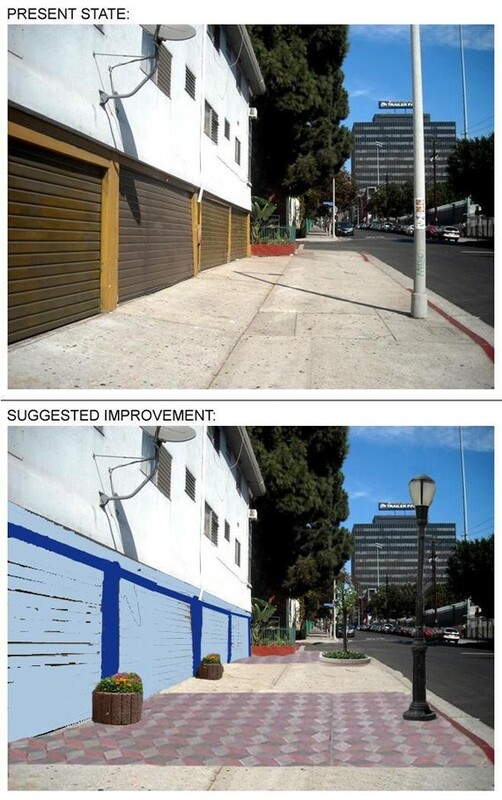 Note: those few inexpensive additions can dramatically improve the spot! Less concrete means better environment. Area #8. Orange Drive (east side), north of Sunset Blvd. PRESENT: What an ugly sidewalk! Primitive concrete, barely any landscaping or trees. Once again, this embarrassment is only a block away from world-famous Hollywood Walk of Fame. IMPROVED: Decorative block-stone sidewalk. Planted trees with guarded base. 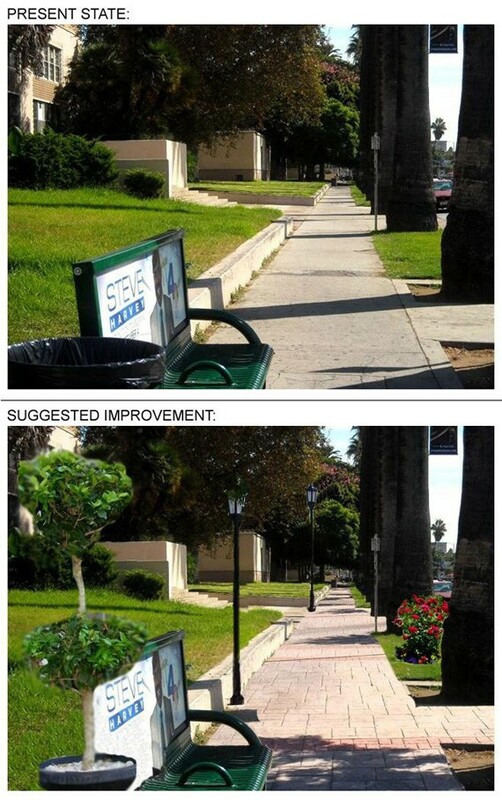 Dramatically improved environment. Area #9. Orange Drive (east side), just south of Hollywood Blvd. PRESENT: Ugly sidewalk continued. Same old concrete with gum & gunk. Nondescript trees with unprotected base. IMPROVED: Decorative block-stone sidewalk. Trees are now protected with guarded base. Overall major improvement! Area #10. Orange Drive (west side), just south of Hollywood Blvd. PRESENT: Primitive concrete sidewalk. No trees or buffer zone. “Green wall” (left side) barely adds to walkability. IMPROVED: Decorative sidewalk with partial block-stone pavement. Planters are placed, serving as a “buffer zone”. 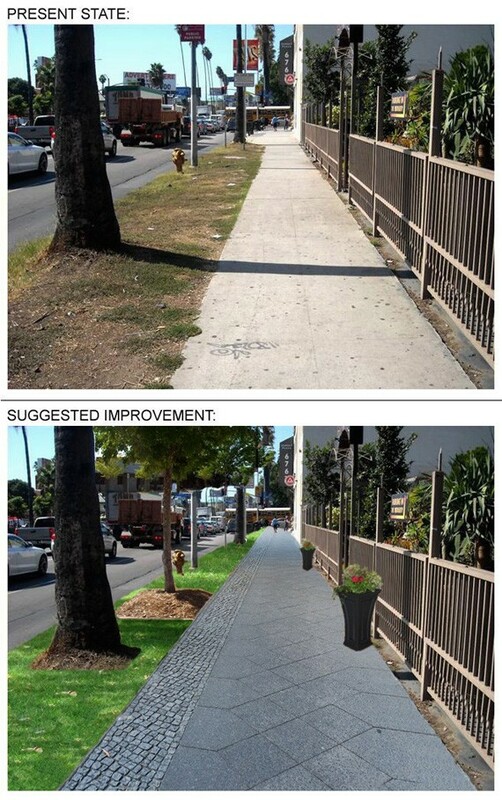 Note: even without trees the sidewalk landscaping can be dramatically improved! Area #11. La Brea Avenue (overall). PRESENT: Typical L.A.’s primitive street, built only for automobiles, with little-to-no landscaping, primitive sidewalks. 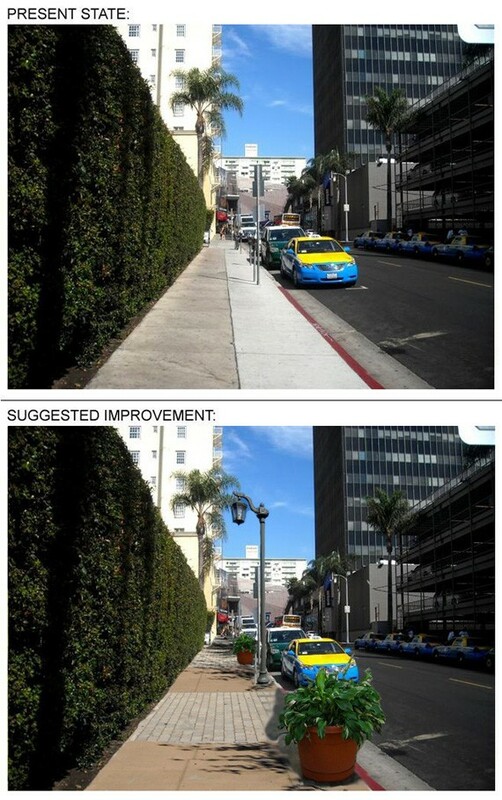 IMPROVED: Center median with trees and plenty of greenery. 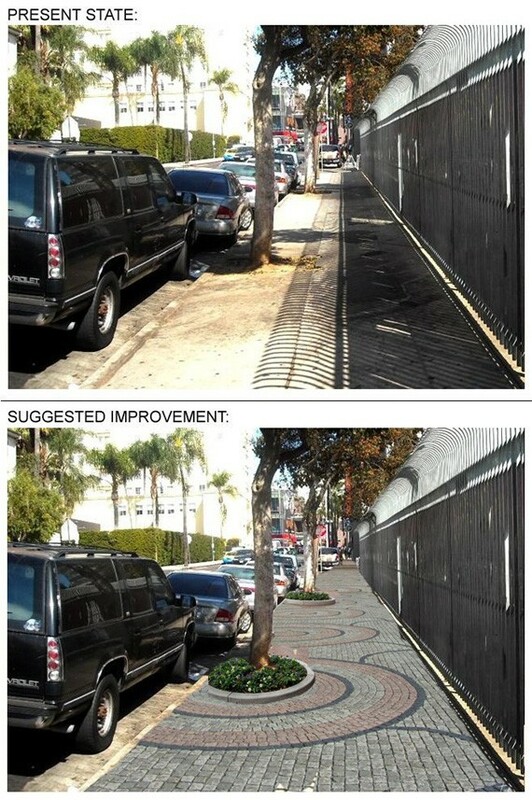 Improved sidewalk landscaping. Note: The nearby Highland Avenue is much better developed, providing a center median; and better, wider sidewalks with landscaping. 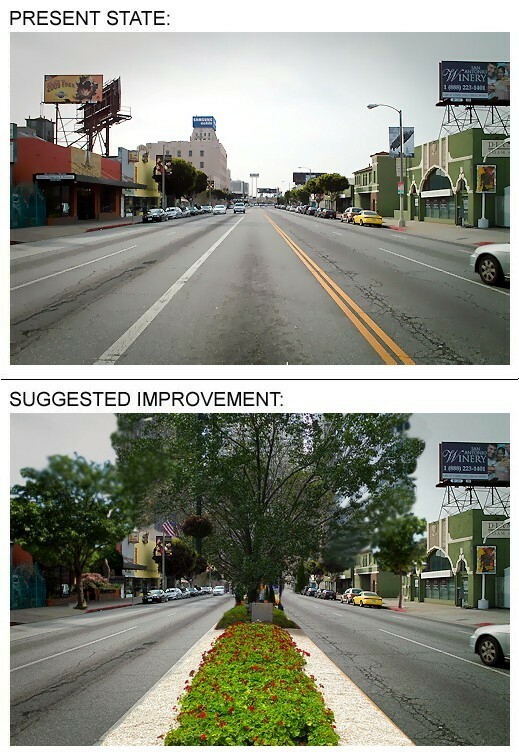 La Brea Ave could be redeveloped similarly to Highland Avenue. In general, La Brea Avenue has great potential. With many galleries and upscale restaurants, the street should be upgraded to be a true pedestrian boulevard! PRESENT: Primitive sidewalk, mix of half-broken concrete slabs with layers of asphalt. Barely any landscaping, consisting of a poor nondescript trees. IMPROVED: Decorative sidewalk. Plenty of deciduous trees planted, now serving as a buffer zone. 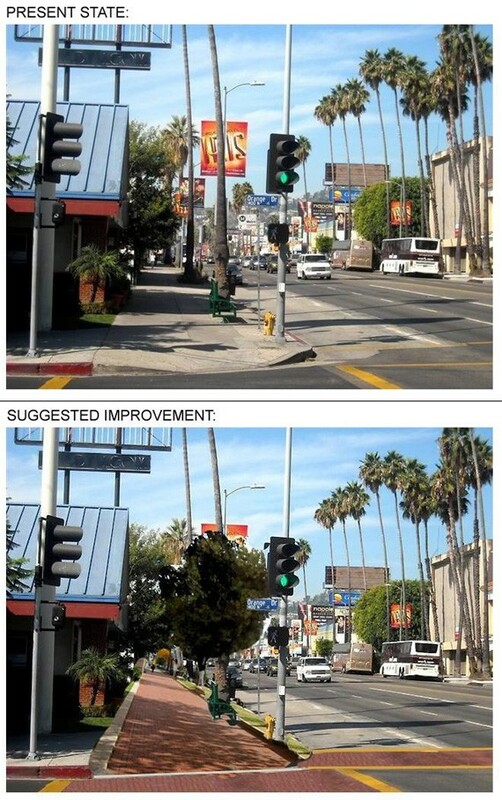 Dramatically improved pedestrian environment. PRESENT: Primitive concrete sidewalk, no landscaping. Ugly black building. Generally, buildings should never be black- colored, as they carry no aesthetics! Note: existing wider sidewalk and decorative streetlight does not improve the overall streetscape due to naked concrete sidewalk (no landscaping) and presence of black-colored building. IMPROVED: Decorative widened sidewalk, added planters and bench. Black building is replaced with much better, aesthetically correct buildings. 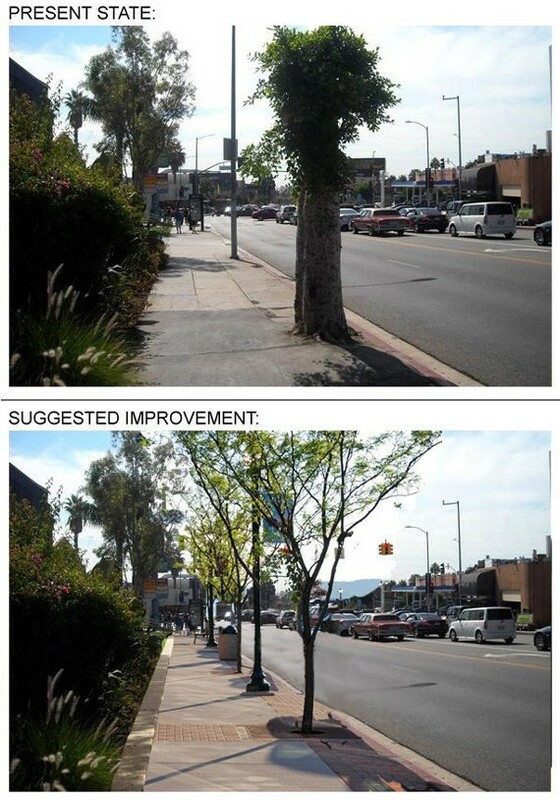 You can notice dramatic improvement of the streetscape. PRESENT: Primitive sidewalk consisting of concrete slabs. No landscaping or any (!) other pedestrian-friendly facilities. IMPROVED: Decorative sidewalk, planted trees with guarded base. Dramatically improved overall landscaping. PRESENT: One of the dirtiest, least maintained bus stops you could ever encounter! Tons of trash, filthy concrete sidewalk, no bus shelter, ugly trash bin. Note: this is only two blocks from Hollywood & Highland, a major tourist center! IMPROVED: Partially decorative sidewalk, with lawn. Added planter. Clean bus shelter. Simpler trash bin. Decorative streetlight. 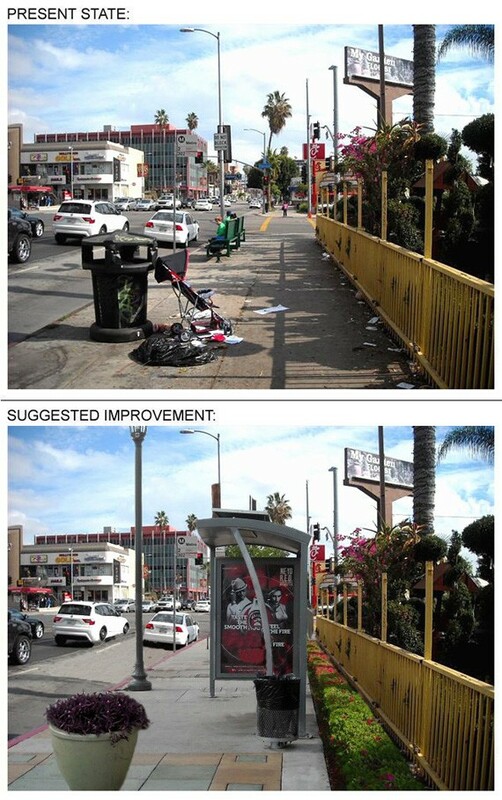 Better maintenance of bus stop. Note: this setting is already used on nearby Santa Monica Blvd bus stops. Images above show a dramatic difference between: “PRESENT” and “IMPROVED” conditions. All we need is a proper mindset of city planners, who would consider pedestrian-oriented infrastructure. Intersection by intersection, area by area, district by district, our streets can be revitalized, and the pedestrian environment can be improved. I’m embarrassed to keep hearing, “L.A. is an ugly, underdeveloped city” from friends and visitors. Nevertheless, Los Angeles has many advantages: great & warm climate, flat terrain, wide streets. Our city has a huge potential to become a true pedestrian-friendly place where families can enjoy time outdoors year-round, and where people can walk safely. It’s rather ironic that the city with the best climate has the worst possible pedestrian (and bicycle) infrastructure! As a result, car dependence is not going away any time soon. People don’t have to be confined to cars. And Los Angeles can be rebuilt as any other normal city. That’s why we have to embrace density, and stop the notorious sprawl with induced car dependence. Density, smart urban growth and pedestrian environment go hand-in-hand. Los Angeles’ population ranks the second in the country, just following New York City. 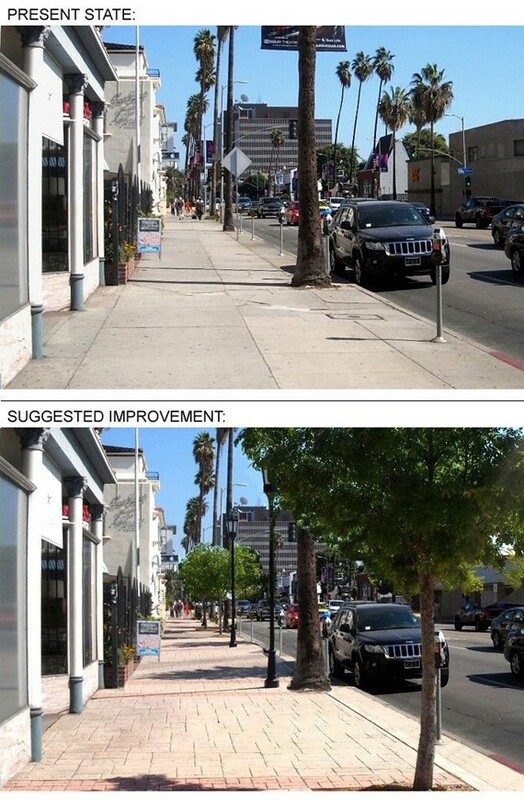 Perhaps L.A. can learn from New York how to create walkable streets. Time for a transition, Los Angeles! Time to upgrade from car-dependence to reliable public transit; from dangerous roads to safe sidewalks and parks; from endless concrete to aesthetical streetscape; from ugly box warehouses to beautiful & architecturally rich buildings; from creepy “Tattoo” and “Smoke” shops to upscale retail centers; and from cheap & health-degrading fast-food stands to family-friendly restaurants. Popularity of The Grove and Americana has proven the dire need of creating pedestrian spaces with retail centers. But instead of building artificial limited areas (The Grove and Americana) – where people are forced to walk in circles – the city as a whole should follow the concept of that same Grove and Americana. Those places are highly popular, stylish, safe, and have proven to work well in urban environments. After all, European cities are built that same way; The Grove and Americana are actually a replica of European design standards. We need walkable streets. Our sidewalks need a serious overhaul. And we need family-friendly parks and public plazas. No doubt, it’s time for Los Angeles to catch-up to the rest of the world! I stumbled into this article while doing research for an urban project I`m doing in my hometown. I have to say, nice inicitaive, congratulations. I live in a city that I believe also needs to be “deuglyfied” (Monterrey, Mexico), as you say it. This renders are a very good starting point. After all if nobody proposed anything (and only criticises what other propose) nothing would ever be done. What a waste of money! I’ve lived here all my life and Hollywood isn’t just Hollywood Blvd and Sunset Blvd. If you look at the side streets and residential area, it’s all ghetto. Sorry but this is really not a good use of funds. No one is hanging out by the side of a building looking at ridiculous sidewalk configurations. There are better ways to spend money from the city. We have walkable streets. The Walk of Fame is fine the way it is and the people who walk around at night don’t care what the sidewalk looks like. Tourists aren’t going around these office buildings or by the school, they want to see the Walk of Fame and buy some souvenirs. This is the dumbest idea I’ve seen in a long time.